SB 978 stops hate groups and terrorists from printing guns that are undetectable and untraceable. SB 978 gives public schools and major airports the right to make security decisions about prohibiting loaded, hidden guns in classrooms and terminals. SB 978 stops the pipeline of unsecured guns to criminals by requiring gun owners to secure their firearms when not in use. Please call these Oregon Senators now to tell them to SUPPORT SB 978! SB 978-5 is an omnibus bill that will regulate undetectable, untraceable, and downloadable guns (often referred to as "ghost guns"); hold strictly liable gun owners who do not secure firearms; require reporting of lost or stolen guns to crack down on gun traffickers; and allow cities, counties, school districts, airports, and other public buildings to not permit concealed handgun license holders to carry firearms into those buildings or areas. City, county, metropolitan service districts, ports, school districts, colleges, or universities are authorized to regulate or prohibit possession of firearms in public buildings by concealed handgun license holders. Ceasefire Oregon hopes this means no more civilians carrying loaded AR 15s will be allowed in the Oregon Capitol Building. Prohibits manufacture, transfer, or sale of military-style assault weapons with exceptions. Civilians who legally own described firearms must register the firearm within one year of the effective date of the law or dispose or permanently disable the firearm. Gun dealers at gun shows or gun shows are permitted to establish a minimum age of at least 21 years of age for firearm sales or transfers. HB 3054 provides legal protection to shooters who discharge a firearm within 500 feet of their homes or at shooting ranges as long as people and property nearby are not endangered. Big problem: shooting in the direction of people does actually endanger them. This Child Access Prevention (CAP) bill holds gun owners responsible when a minor (under age 17) accesses an unsecured gun when the gun owner knows or reasonably should know that a minor could access the firearm. The bill includes a requirement for public education. Allows subtraction from federal taxable income for purchase of qualifying gun safe. Oregon Public School First Graders Learn Gun Safety. Gun Purchasers Do Not. Scheduled for a hearing in the Senate Committee on Education on March 27. Authorizes public schools to provide firearm safety and accident prevention class to all students in first grade. Shooting ranges and “stray” bullets: All rights, very few responsibilities. Allows injured person to bring civil action against city or county that fails to regulate discharge of firearms on private property after having notice of dangerous condition. Creates offense of unlawful use of a bump-fire stock and offense of unlawful transfer of bump fire stock. Directs Department of State Police to establish voluntary firearm Do Not Sell List using secure Internet website. Creates a tax credit for the cost of background checks for firearm sales and allows the travel mileage associated with the background check to be tax deductible. Authorizes school district to allow firearm safety instruction to eleven-year-old students on school property. Prohibits transfer of handgun or assault rifle (defined) to someone under 21 years of age. Expands Charleston Loophole from 3 days to 30 days before firearm may be transferred without a background check. Person subject to a protective order (like an ERPO) who fails to attend hearing will be prohibited from possessing firearms. Requires courts to order firearms to be relinquished for people convicted of certain domestic violence offenses. Requires hospitals to provide data about patients with firearm injuries to the Oregon Health Authority. Child Access Prevention Law: Creates crime of endangering a minor by allowing access to a firearm. This omnibus bill was submitted by Oregon's Students for Change, a group of high-school and college students who understand the changes we must make to reduce gun violence. SB 501 is one of the most exciting and effective gun violence prevention bills Ceasefire Oregon has seen. Requires law enforcement agency that takes custody of firearms under firearms surrender protocol to establish procedures to notify certain individuals of law enforcement agency’s anticipated return of firearm. Requires agency, board, commission or other instrumentality of state that lawfully seizes firearm to transfer firearm to Department of State Lands for disposition as unclaimed property. Allows gun dealer or person transferring firearm, ammunition or firearm component at gun show to establish minimum age for purchase of firearms, ammunition or firearm components, provided that minimum age is at least 21 years. Makes shooting range and person discharging firearm at shooting range strictly liable for injuries resulting from bullets that stray outside boundaries of shooting range. Allows injured person to bring civil action against city or county that fails to regulate shooting range after having notice of dangerous condition. Removes prohibition on local government regulation relating to shooting ranges. A proposed federal rule would change the oversight of gun exports from the State Department to the Commerce Department. The American gun industry has been fighting for this change so they can increase their overseas profits. Under the rule change, American-made guns, including semi-automatics like AR-15s, could easily find their way into the hands of criminals and terrorists overseas. A bill to ban bump stocks and other devices. To amend title 18, United States Code, to expand to all firearms the requirement that Federal firearms licensees report sales of 2 or more handguns to the same unlicensed person within 5 consecutive business days. To provide for a 3-day waiting period before a person may receive a handgun, with exceptions. To impose restrictions on the sale of binary explosives, and for other purposes. (2)has as its primary or common purpose to function by explosion through target practice using a firearm. H.R. 3458: To require certain semiautomatic pistols manufactured, imported, or sold by Federal firearms licensees to be capable of microstamping ammunition, and the prohibit the removal, obliteration, or alteration of the microstamped code or microstamping capability of a firearm. To deregulate firearm suppressors, better known as silencers. According to the ATF, more than 18,000 firearms were reported lost or stolen from FFLs in 2016 alone. This represents a more than 20% increase over the nearly 15,000 firearms reported lost or stolen in 2015. HR 3361 proposes strong, effective laws to address the issue of firearm theft from federally licensed firearms dealers (called FFLs). This bill would require federally licensed firearms importers, manufacturers, and dealers to meet certain requirements with respect to securing their firearms inventory, business records, and business premises. Relaxes laws regarding transportation of firearms. Changes burden of proof to prosecution. The IP 43 campaign, Lift Every Voice Oregon, will refile for the 2020 ballot and will also work to pass a ban on assault rifles and high-capacity magazines in the 2019 legislative session. Rather than allow Oregonians to determine their own fate, the National Rifle Association has put gun profits over the lives and the will of Oregonians. They know that Oregonians overwhelmingly support a ban on assault weapons and high-capacity magazines. Urges Congress to enact legislation to define and regulate rapid fire enhancing accessories in same manner as fully automatic weapons, and to define and regulate partially completed firearms components and kits and firearms that are assembled from them. Urging Congress to regulate assault rifles and bump stocks similar to machine guns. 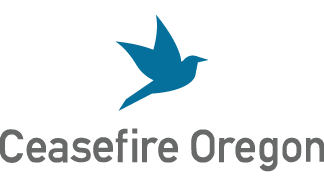 Ceasefire Oregon supports SJM 201 and encourages the Oregon legislators to take action in Oregon to ban assault rifles and high-capacity magazines. Fix NICS: Enforce current law regarding the National Instant Criminal Background Check System. This bill combines the previous bills, SB 797 and SB 764, into one bill. Creates crime of endangering a minor by allowing access to a firearm. Requires gun dealer to post notice concerning obligation to prevent minors from accessing firearm without consent of minor’s parent or guardian. A person protected by a stalking protective order, a restraining order or any other court order prohibiting another person from contacting the person, may carry a concealed gun if that person has a pending application for a concealed handgun license or has a scheduled appointment to submit an application for a concealed handgun license. Signed by Governor Kate Brown at a special ceremony on September 18, 2017. The bill creates a process for obtaining extreme risk protection order that temporarily prohibits a person from possessing firearms when court finds that person presents imminent risk, or risk in foreseeable future, of suicide or causing injury to other persons. Allows person without concealed handgun license to carry concealed firearm on person or in vehicle in certain circumstances if person can legally possess firearms under Oregon law. Repeals SB 941 that requires a person who is not a gun dealer obtain criminal background check prior to transferring firearm to another person who is not a gun dealer. Modifies definition of "transfer" for purposes of private firearm transfer criminal background check requirement. Excludes from definition temporary provision of firearm for purposes of hunting, trapping or target shooting while transferee is preparing to engage in, or in process of completing, activities related to hunting, trapping or target shooting. Status: Senate Finance Committee in Washington, D.C.
School districts are prohibited from establishing policies regulating, restricting, or prohibiting firearms. Prohibits governmental agency or school district from establishing policy regulating, restricting or prohibiting firearms. Provides that policy contrary to prohibition is void. Exempts federal and state military personnel from laws establishing crime of unlawful possession of firearm when engaged in official functions on military property. Authorizes Governor or Adjutant General to issue regulations regarding use and possession of firearms on military property. Proposing amendment to Oregon Constitution relating to firearms. Status: Referred to Judiciary with subsequent referral to Rules. Authorizes county to regulate purchase of used firearms by pawnshops and secondhand stores. No gun background checks for concealed handgun license holders. Defines term "antique firearm." Provides that unlicensed person transferring antique firearm to another unlicensed person is not required to request criminal background check. Expanding CHL privileges to retired parole and probation officers. Status: Referred to Judiciary with subsequent referral to Ways and Means. Repeals requirement that person engaged in business of selling, leasing or otherwise transferring firearms record in register purchase or acceptance in trade of used firearm and provide copy of record to law enforcement agency. The primary intent of this bill is to repeal SB 941, the Oregon Firearm Safety Act which requires background checks for almost all firearm sales. An unintended consequence could be to prevent law enforcement from receiving trace data concerning guns used in crimes. Requires court to ask petitioner at hearing for family or household abuse restraining order whether respondent possesses any firearms and to record answer on order. Directs presiding judge of judicial district to adopt protocols relating to surrender of firearms by persons prohibited by court order from possessing firearms. • Expands Brady background checks to all gun sales to keep guns out of the hands of dangerous people like felons, fugitives and domestic abusers. • Improves reporting of prohibited purchasers to the National Instant Check System (NICS). • Requires federal agencies to certify that they have provided appropriate records to NICS. • Incorporates and expands regulation about people determined to be adjudicated mentally ill.
• Requires gun owners to report their lost or stolen firearm(s) within 48 hours. Information provided by the Brady Campaign.